Best pizza ever. I got these amazing beet and onion sausages from The Meat Hook, and the creamy burrata cheese and fresh ramps from The Brooklyn Kitchen. Two places you should definitely stop by if you haven’t already! 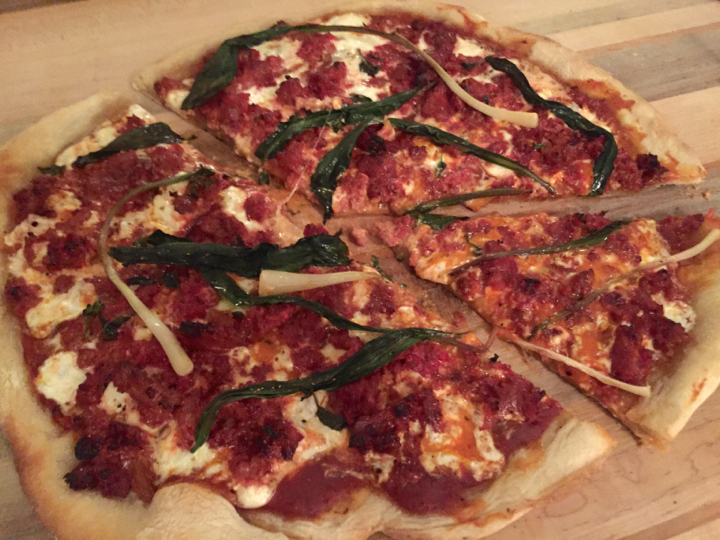 It was definitely one of my favorite pizza recipes I have made so far. 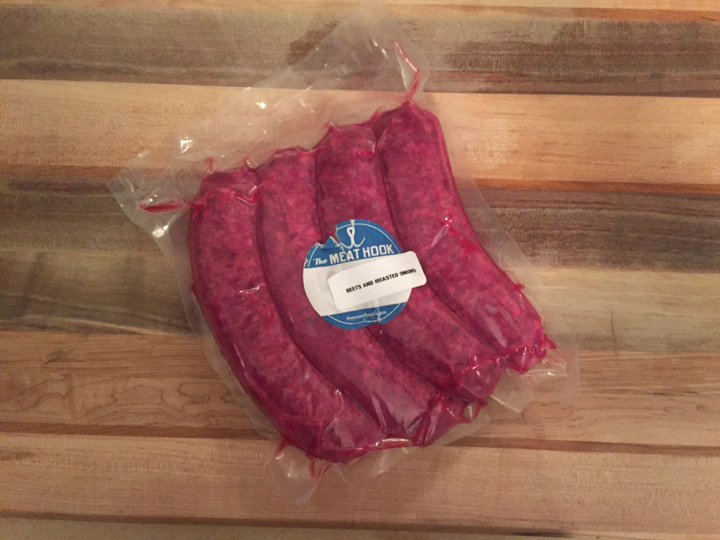 The sausage is so delicious, it has a subtle beet flavor, but nothing too wild. 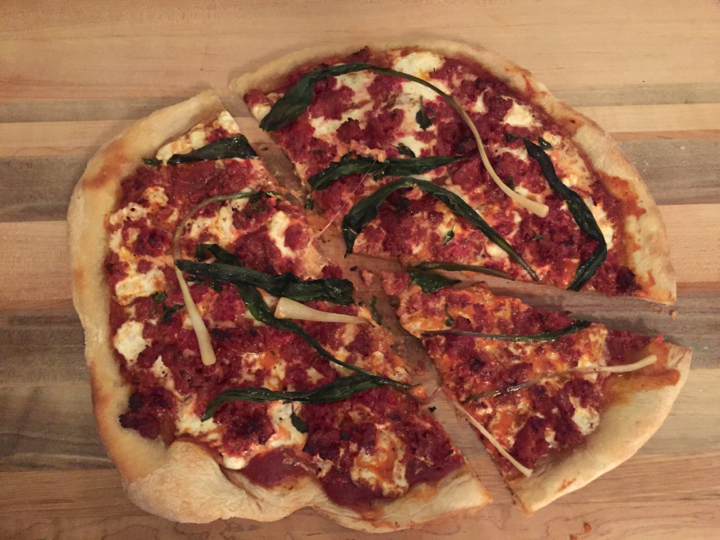 By the way, this was the first time I ever put burrata on a pizza, and it will not be the last. 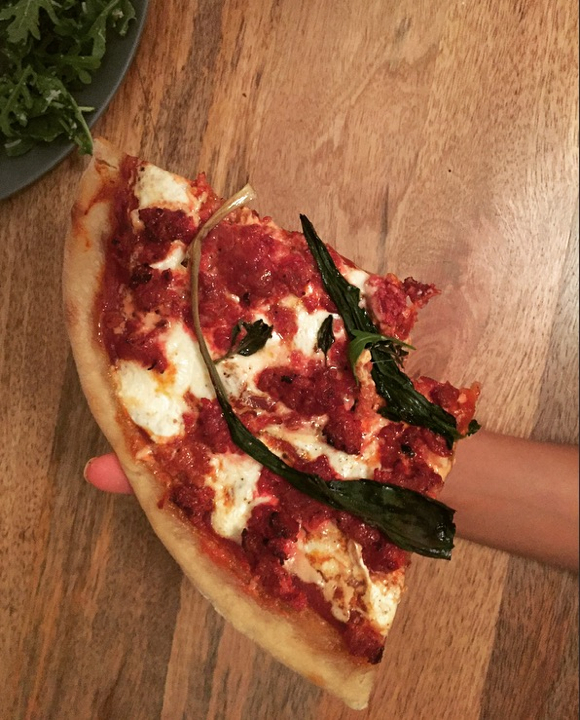 I was concerned that it would make the pizza watery, but it didn’t, it was perfection. 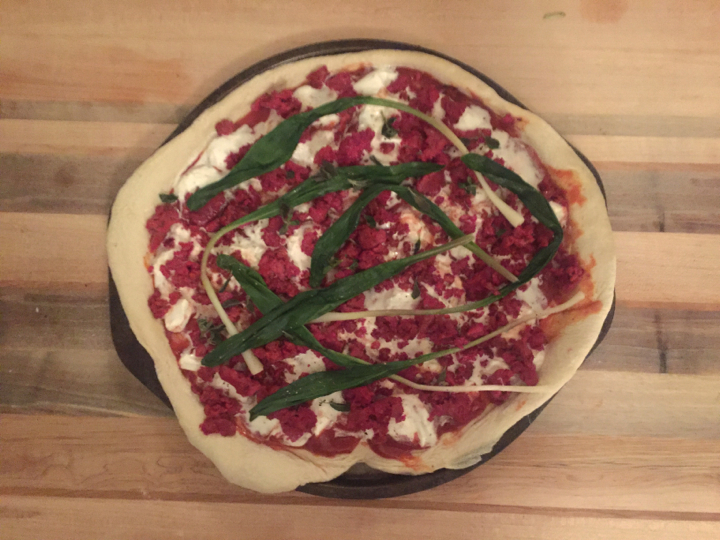 And ramps… because it’s ramp season for only so long! 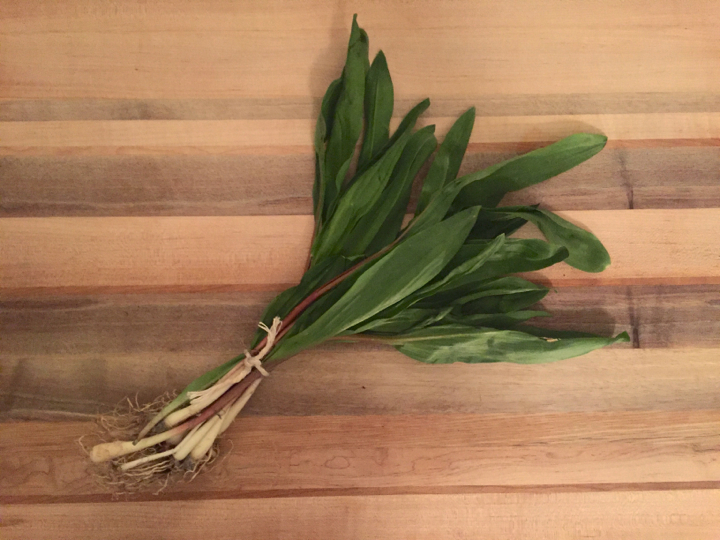 Ramps are also called “spring onions” or “wild leeks” – they are in season for a very short time in early Spring, and people go nuts for them. They are from the leek family, but are stronger tasting than leeks and have a garlicky taste to them as well. Get em’ while you can! Preheat oven to 425 degrees. 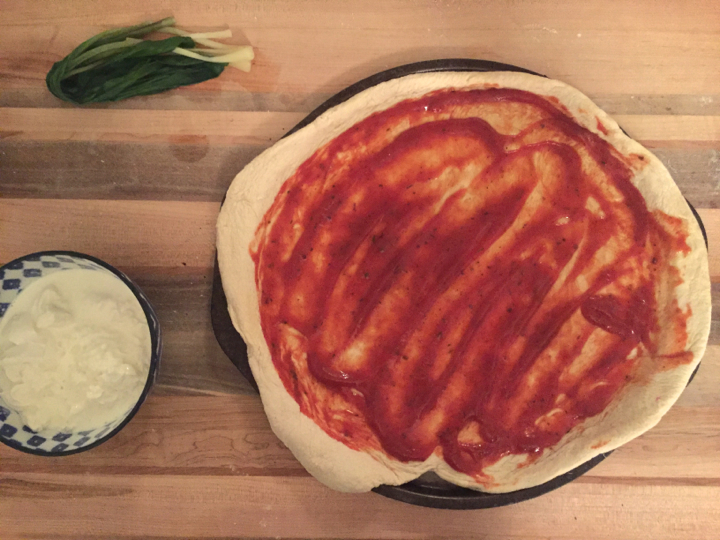 On a large floured surface, roll out your pizza dough. I like to roll it out, let it rest for a few mins (as it will scrunch up) then roll it out again to ensure it stays on the thinner side. Set aside. Add a little olive oil to a pan and cook the sausage over medium high heat, breaking it up into smaller pieces until cooked thoroughly. Pour out any extra oil drippings. While that cooks, get a small pot of water boiling, and blanch the ramps (whole) for about 30 seconds. Then remove and set aside. For the burrata, simple cut it up in a bowl so that you have smaller chunks. To assemble, place the dough onto a baking sheet. Drizzle a tiny bit of olive oil on the dough, then lightly salt and pepper, and spread on the pasta sauce. 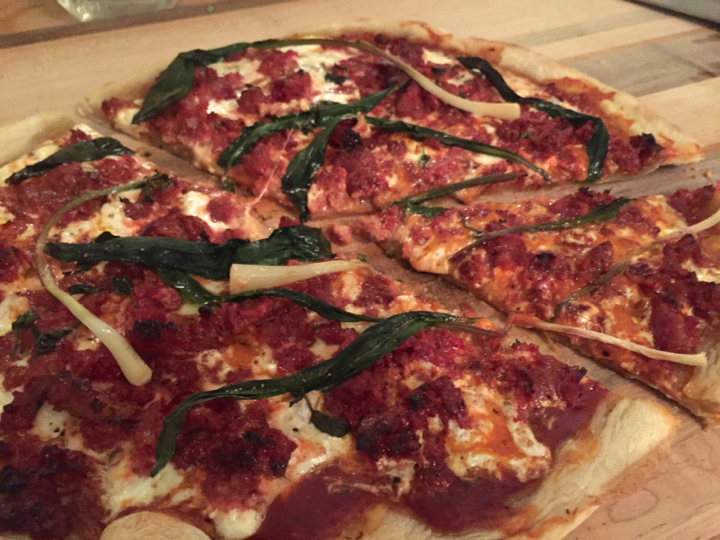 Spoon the burrata all over the top, followed by the cooked crumbled sausage. 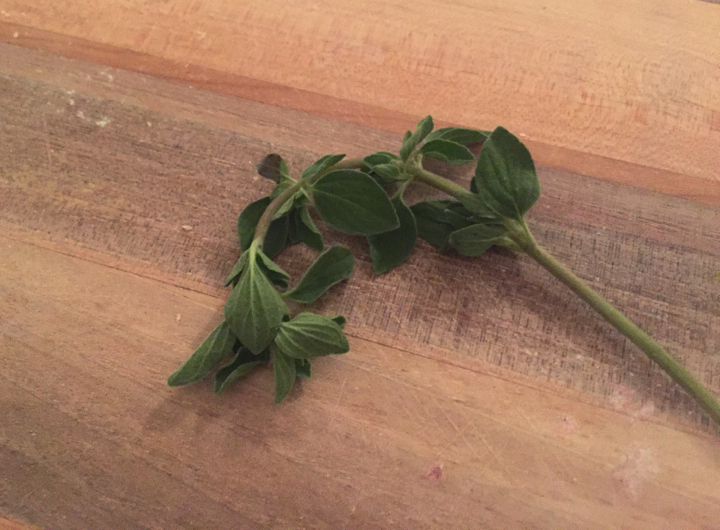 Finish with the ramps and fresh oregano. Place in oven for 15-20 mins, or until the crust is golden brown and the top is bubbling. ENJOY!